Imagine taking a full-sized Escalade ESV and cutting off the back portion. That's the basic idea of the Escalade EXT. The EXT features a small exposed truck bed separated from the passenger compartment by a type of a door called a midgate. The 2nd row seats can be folded and the midgate lowered to extend the cargo area from behind the driver's seat through to the back of the bed. 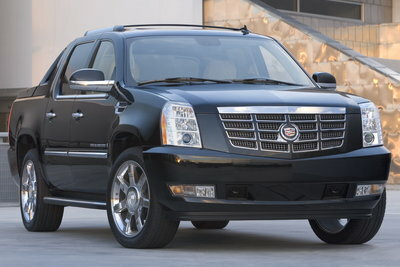 Similar to the Escalade and Escalade ESV, the EXT model is powered by a 400hp 6.2L V8. A six-speed automatic and all-wheel-drive are standard.